… And we are certified Leadership coaches! Krishnan and I love to coach. My leadership style is a coaching leadership style and I always believed that every individual is a star performer. I also think as a leader its my responsibility to create the environment where each employee can shine and live upto his or her potential, exceed even. I have also had a deep conviction that when a manager or leader is able to connect an individual’s life purpose with the work that he or she is doing the engagement is much deeper. 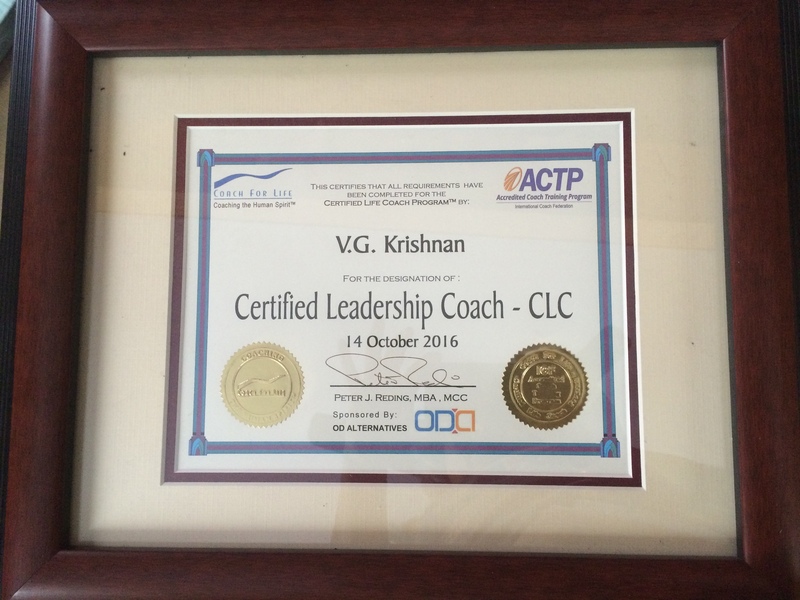 Krishnan’s leadership style is very similar and he has been doing this over a much longer period of time and with a lot more creativity and innate ability than I have. I have had the advantage of more books being available about coaching and by being coached by a master coach like Venki Iyer. Venki – thank you, this again is because of you, and you continue to remain an enduring role model for me. Research also says that “Mastery”, “Autonomy” and “Purpose” are the new engagement drivers. I believe they aren’t new, they are just being discovered now because most work today is not about “production” and turning screws in a factory for eight hours. Do read this amazing book by Daniel Pink, “Drive – the surprising truth about what motivates us” and the RSA animate video is at the following link – RSA Animate – Drive, the surprising truth about what motivates us. Very simply put, most people are looking for purpose and meaning in their jobs and if the organisation’s purpose violates some basic values or the life purpose of an individual, there is deep disengagement. Either the person quits or is a source of negative energy within the organization. If there is deep resonance with the organisation’s values and purpose, the employee is usually a happy camper, and an engaged employee. I stayed for 11.5 years with Aon Hewitt because of this deep resonance with the organisation’s values and purpose and my own. I still value my time in that organization and still think of it as home. The other two factors are also important, does the job let the employee “master” something, some new skill, some new learning and is there enough “autonomy” for an employee to function. Infact “autonomy” can also be interpreted as the freedom to fail … you do fail sometimes when you try something new. Show me someone who has never failed, I will you someone who hasn’t tried enough new things. As a leader, I tried, and try always to find the connect for a team member with the organisation’s purpose. I also try to see if the role allows the person to learn something new all the time, making them valuable as individuals. And of course, everyone who worked with me knew they could try anything new and I have their backs if it failed and they could bask in glory if it succeeded. Now, coaching allows me to do the same things even more effectively. So the shift to becoming a Leadership coach from a corporate employee in my case, is hardly a shift. Its just continuing my work, from the outside! 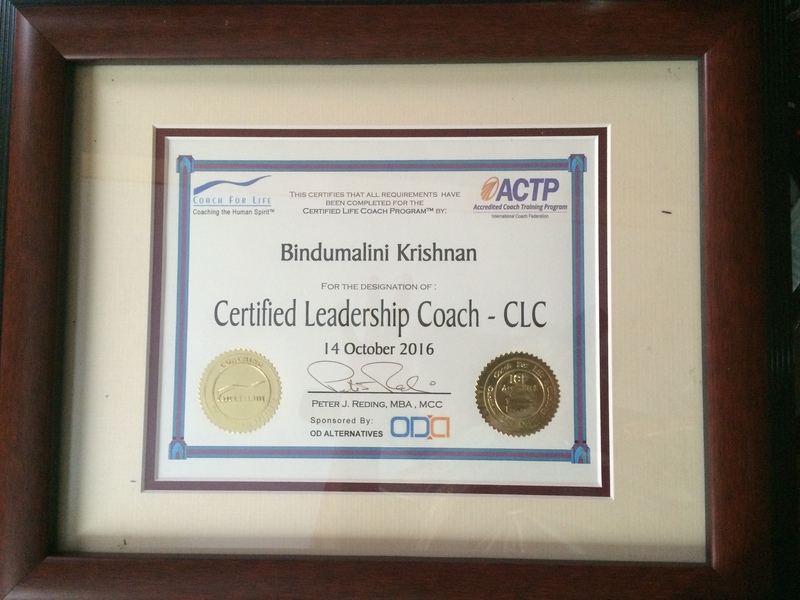 This certificate is much valued because the training that Krishnan and I went through along with six other amazing coaches, over six months nearly, has helped us identify several strengths that we have and didn’t know about ! Learning from observing how another coach deals with a given situation is huge. The process was rigorous and Peter Reding, our master coach and trainer is simply outstanding. Super thrilled with the certificate and I am grinning ear to ear like a kid who has got a new toy :). Thank you Peter and all our fellow peer coaches for an awesome learning experience. Many Congratulations to both of you! Congratulations Ma’am and Sir, I fully agree on importance of aligning of life purpose and organization purpose. Thank you for being my coach and helping me achieve or probably exceed in the development sector!. You both have played an important role in my personal and profession life, Confident you both would continue to guide me. THANK YOU! Thanks Mansoor. We are very proud of your achievements and its our privilege to know a wonderful human being like you. God bless you and the awesome work you do.